Julia Serano update - NEW BOOK release & tour dates! Julia's NEW BOOK release and tour! click the link to read excerpts and reviews about it! It officially comes out October 1st, but a lot of stores (including online book sellers) have it in stock already! I could imagine that people who read that review without having read the whole book might presume that I am denying that gender norms, assumptions, stereotypes, etc., often work together in a coordinated way to legitimize certain people but not others. Or that I am denying that gender-based oppression is institutionalized and entrenched in our culture. I can assure you that I do not deny any of these things. So in the last two days, two articles have come out about how trans women are often excluded from, or made to feel unwelcome within, lesbian and queer women's communities. The dyke-oriented magazine/website Velvetpark just published my piece "How to Be an Ally to Trans Women." 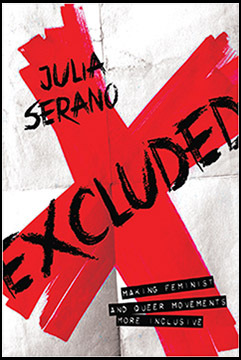 It is an excerpt from my new book Excluded: Making Feminist and Queer Movements More Inclusive, which officially comes out October 1st, but may appear in stores as early as mid-September, so keep an eye out for it! The other article appears in the Huffington Post, and is called "Are Queer Women Leaving Trans Women Behind?" Several trans women are interviewed in it, including myself. Some much needed attention for an issue that is often overlooked or ignored... -j.